Today we visited the Kennedy Space Center Visitor Complex. During our visit, we learned that the next launch attempt for Endeavour will be early Wednesday morning, which means we need to get there late Tuesday night. We’re still melting here with temperatures (upper 80’s to mid 90’s) and high humidity that we’re just not used to. This Rock Pigeon we saw yesterday at the Intracoastal Waterway Park under the Merritt Island Causeway was pretty hot, too. From a distance we saw it swimming in the Indian River. At least, it looked like it was swimming. It was probably standing on a rock in the river but whatever it was doing, it was getting pretty wet. You can see the wet, disheveled feathers in this photo I took shortly after it left the water for a sunbath on the railing. I wish I could have jumped in the water, too. 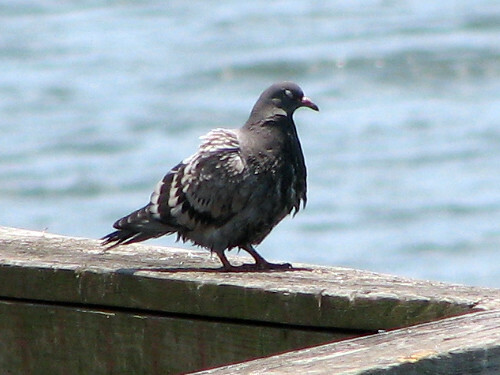 This entry was posted in Florida, Pigeons!, Travel. Bookmark the permalink. Haha, he looks so happy. His eyes are shut and he’s basking in the sun! Yes living or visiting in Florida this time of year can be tormenting. But not as bad as August and September. And you are right that Space Center is more hot than any other place I think. I was there a couple of months ago to watch the last one and thought I would die from the heat. The next day we had two weeks of rain and cooler temps. Not for long though!